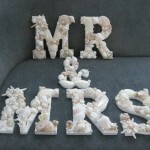 The perfect beach wedding decor – my handmade “MR & MRS” letters in all natural, white shells! 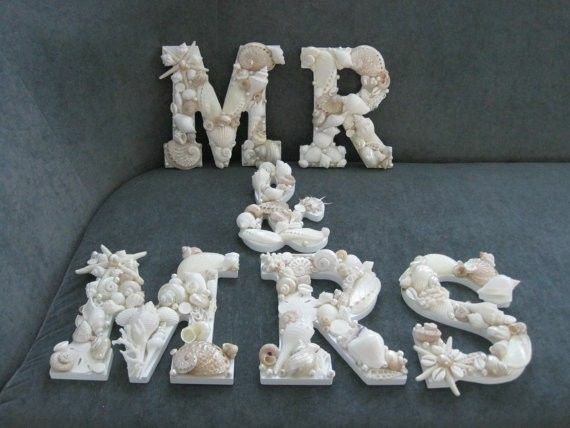 The wooden letters with stunning exotic shells are perfect for such an occasion, and are a wonderful keepsake even after your wedding! I used gorgeous abalone shells, turbo shells, sand dollars, white arks, beautiful exotic coral and other white and cream colored shells from the Caribbean and Indian Oceans. I added pretty white pearls for the final touch! The letters have a hole predrilled in the back for easy hanging. I can do any words, initials, or just one letter if you would like a custom order. It can be done in white, colored shells, or seaglass. Just give me a theme and I will create it for you! The letters generally measure 9 1/2 by 5 1/2 inches. Each letter is $30. Just convo me if you have any questions or if you want me to do a custom order for you!